NEW ORLEANS – The stage is set for the ultimate NJCAA outdoor track & field meet of the season, and the teams sitting atop the National Team Rankings – announced by the U.S. Track & Field and Cross Country Coaches Association (USTFCCCA) on Tuesday – are the teams that have sat near the top all season long. 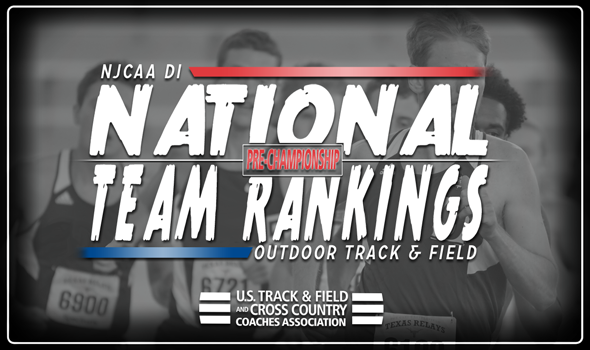 Despite the National Team Rankings being determined this week solely by qualifiers for the NJCAA Division I Outdoor Track & Field National Championships, it did not really change anything atop the rankings, as the top-eight teams in both the men’s and women’s rankings remain in their respective slots from a week ago. The NJCAA Division I Outdoor Track & Field National Championships begin on Thursday, May 17, in El Dorado, Kansas. The meet will wrap up on Saturday, May 19. South Plains (Texas) has won the last 11 NJCAA Division I Outdoor Track & Field Championships, and it’s very possible that it will make it 12 after the weekend is through. Heading into the championships sitting first in the rankings, the Texans boast a whopping 29 top-10 Descending Order List marks, as well as 10 in the top-three. The Texans also have the top marks in NJCAA Division I in the 4×400 relay, long jump, triple jump and javelin. The Texans also picked up the 2018 NJCAA Division I Indoor Track & Field Championship earlier this year. Barton (Kan.) CC sits second in the rankings, and actually has one more top-three Descending Order List mark than South Plains (Texas). The Cougars also have the top marks in the 100, 110 hurdles, 400 hurdles, shot put and hammer. However, Barton (Kan.) CC only has 24 top-10 Descending Order List marks to the 29 by South Plains (Texas). After the two aforementioned teams, there is a considerable drop off in top-10 Descending Order List marks by the next three teams in the rankings. Cloud County (Kan.) CC (16), Iowa Central CC (15) and Central Arizona (14) are the only other teams with double-digit top-10 Descending Order List marks, but sit far behind South Plains (Texas) and Barton (Kan.) CC. Top-ranked New Mexico JC will be looking or its second outdoor championship in a row, as the Thunderbirds won its first outdoor title in Hutchinson, Kansas, a season ago. An outdoor title this year would pair quite nicely with the indoor title it captured earlier this year. The Thunderbirds are sitting pretty heading into El Dorado, Kansas, as it leads the pack in top-10 NJCAA Division I Descending Order List Marks (28) and top-three NJCAA Division I Descending Order List Marks (14). New Mexico JC owns the top marks in NJCAA Division I this season in the 100, 4×100 relay, 4×800 relay and long jump. Right behind the Thunderbirds in the rankings is Central Arizona, which could make things very interesting. In the Computer Rankings, the Vaqueros are only about 73 points behind New Mexico JC, which is a much tighter gap than the men’s top-two teams. Central Arizona heads into the meet with 21 top-10 NJCAA Division I Descending Order List marks, as well as 12 in the top-three. The Vaqueros own the top marks in the shot put, javelin and heptathlon heading into the weekend. Iowa Central CC sits third in the rankings, but is tied with Central Arizona with 21 top-10 NJCAA Division I Descending Order List marks, but actually leads the entire pack with five first-place marks. The Tritons have a stranglehold on distance races, owning the top times this year in the 800, 1500, 5000, 10,000 and steeplechase. Teams four through seven in the rankings all have double-digit top-10 NJCAA Division I Descending Order List marks heading into the championships: South Plains (Texas) (19), Barton (Kan.) CC (15), Western Texas (13) and Cloud Country (Kan.) CC (12).